Water agencies face reduced revenues and higher enforcement cost when implementing conservation polices to preserve limited water resources. Many water agency boards have required local water agencies to submit conservation plans in exchange for financial assistance, which compels them to modify their business plans. Many water agencies are looking for new ideas to boost revenues and optimize performance. Holman Capital, in partnership with an experienced Solution Team of leading engineering and water infrastructure specialist provides a comprehensive solution to water agencies. The goal is to modernize America’s infrastructure, while improving revenues, reducing operating costs, and enhancing the customer experience. 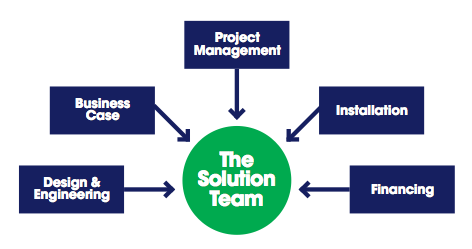 The Solution Team combines the design & engineering, business case, project management, installation, and financing into one comprehensive solution. Thus, the water agency can focus its resources on its customers and employees. Water meters measure the consumption of water for the utility consumer. The installed meter’s accuracy over time will decline due to wear. As such, the meter will typically under register the volume of water product delivered to the customer. By replacing older meters it enables the water agency to measure usage accurately and charge the customer accordingly. Additionally, adding advanced meter infrastructure (AMI) software and hardware will enable the agency to collect usage data remotely, identify system leakage, and schedule repairs to boost revenue. For example, a 20,000 connection water agency is experiencing a 10% annual production loss due to water leakage and inaccurate metering. At an average cost of $2.50/HCF this could result in annual losses in excess of $2.0 million. Improving customer meter accuracies a mere 3% can increase revenues as much as $600,000 per year. Assuming the project cost $3 million to complete, the water agency could recover its cost within five years. Assessing your needs and picking the right team are keys to success. Holman Capital Corporation partners with leading engineering and water infrastructure firms to provide a seamless solution to save you time, boost revenues, and improve operational efficiency. The Solution Team can assist your water agency with developing a comprehensive plan to provide stable revenues, control cost, and improve the customer experience. Please contact The Solution Team today for a consultation.